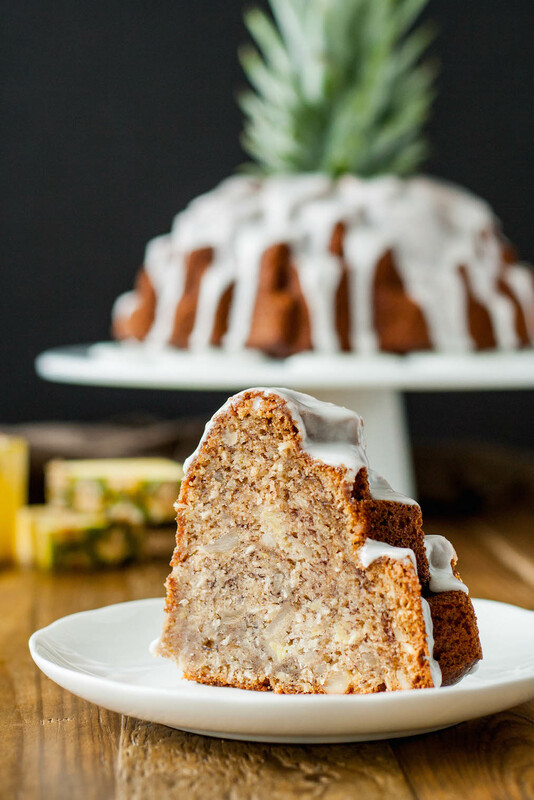 This Aloha Bundt cake is loaded with the very best Hawaii has to offer – bananas, pineapple, coconut, and macadamia nuts! Last month at this time, I was sitting on the lanai of a fabulous condo on Maui, staring out at palm trees and bright blue water, listening to the birds. This month, even though our condo is pretty nice and the view is awesome, it’s certainly no Maui. Not to mention that the sound of birds is replaced by the sound of construction and trains. So, instead of daydreaming about being back on Maui, I decided to create a little bit of paradise at home… Sigh, a train is literally barrelling down the tracks and drowning out the sounds of any other life as I type this. This month’s #BundtBakers theme — Fruit & Nut — comes to us from Shilpi at SimplyVeggies. I had originally planned to do a simple banana walnut bundt, but the trip to Maui inspired me to do something a little more tropical. 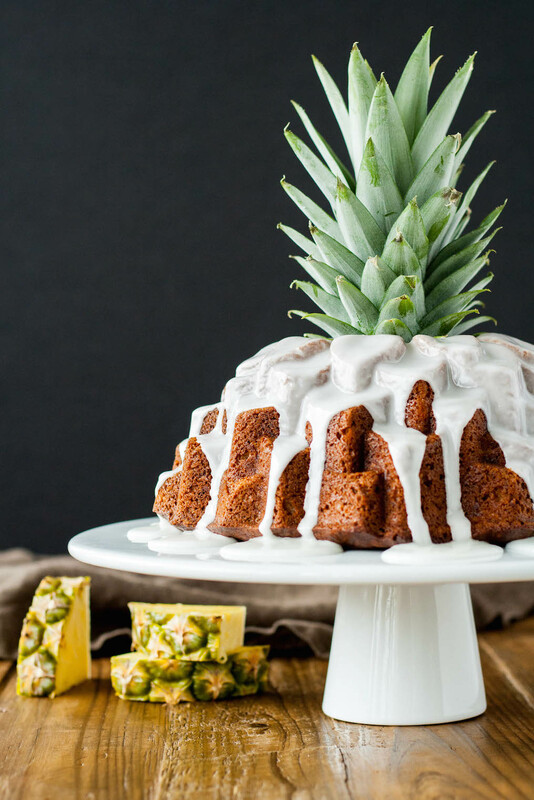 Ok, maybe a lot more tropical… this is one loaded bundt! My sister-in-law, Nissa, had a pineapple banana bread recipe that I used as a base for this. It’s full of bananas, pineapple, and coconut, and I threw in some macadamia nuts for good measure. If that doesn’t scream Hawaii, I don’t know what does. Deciding on a bundt pan and style is always a challenge (for me), but it’s also one of the most fun elements. 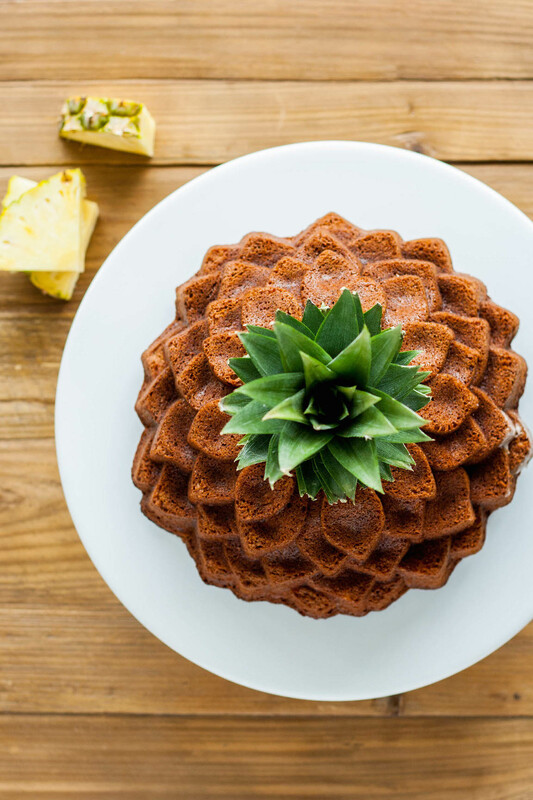 Did you know that there is actually such a thing as an Aloha Bundt pan? Well, there is. I don’t have said pan, and I certainly didn’t need to try to track it down for what would likely be a one-time use, so I had to decide between the four bundt pans I do own. 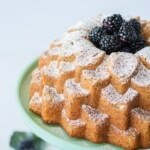 The one that felt most tropical to me was the Blossom bundt, which I had just used for last month’s bundt cake. This was not ideal since I like to mix things up, but the Blossom bundt was easily the best fit for this. 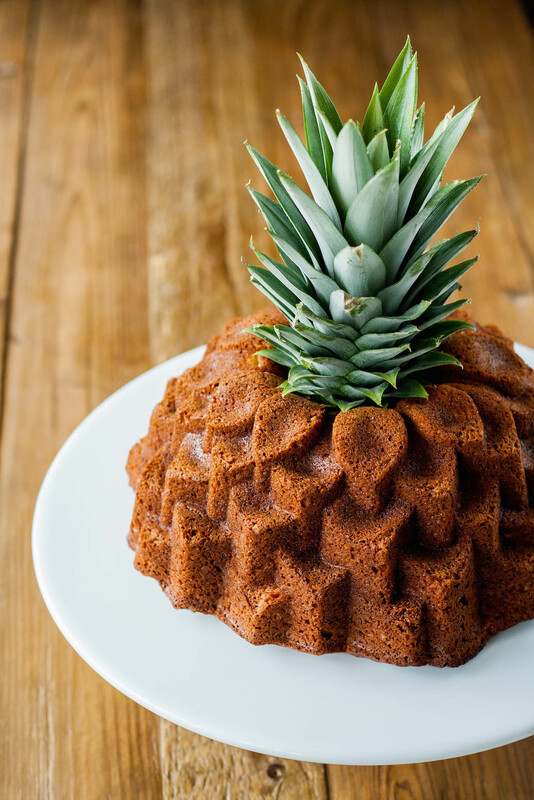 I don’t know how I decided it would be a good idea to chop off the top of a pineapple and stick it into the center of the bundt, but I’m so glad I did. I love the way it turned out! 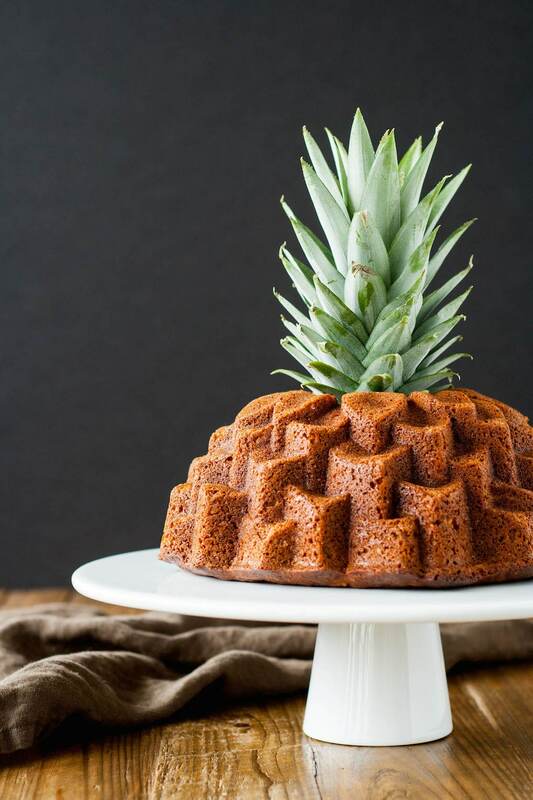 I know it doesn’t quite look like a pineapple, but I think it goes pretty well with the bundt pan. I couldn’t decide if I wanted to glaze it, which is why there are two sets of pictures. I actually prefer the unglazed look and feel that it looks more like a pineapple, but it also looks a bit plain. It needed something, and the last bundt had a sugar dusting, so this one’s got a glaze. Plus, who doesn’t want glaze?? Just give me an extra bowl of glaze on the side so I can dip pieces of the cake into it. 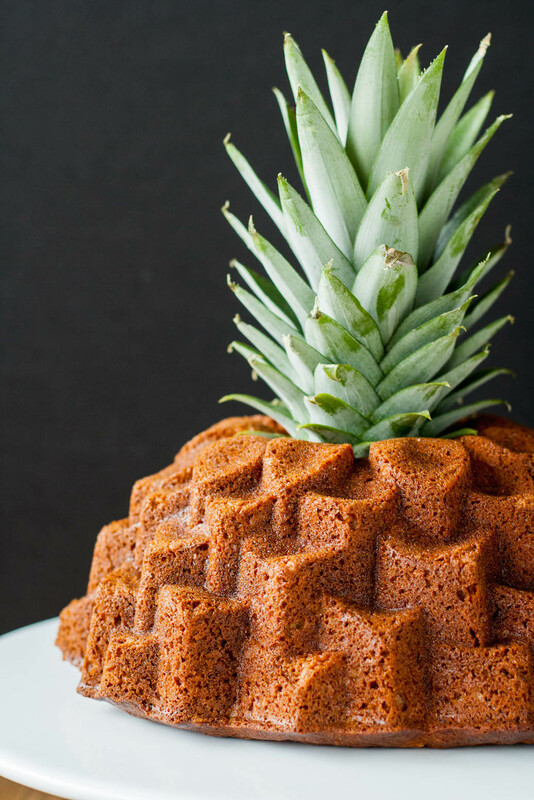 This Aloha Bundt Cake truly tastes amazing. It’s super moist and flavourful, with just the right amount of varying flavours and textures. If you don’t like coconut or macadamia nuts you can easily leave them out, or change the type of nut. If you don’t like pineapple either, then how have you made it so far down this post?? 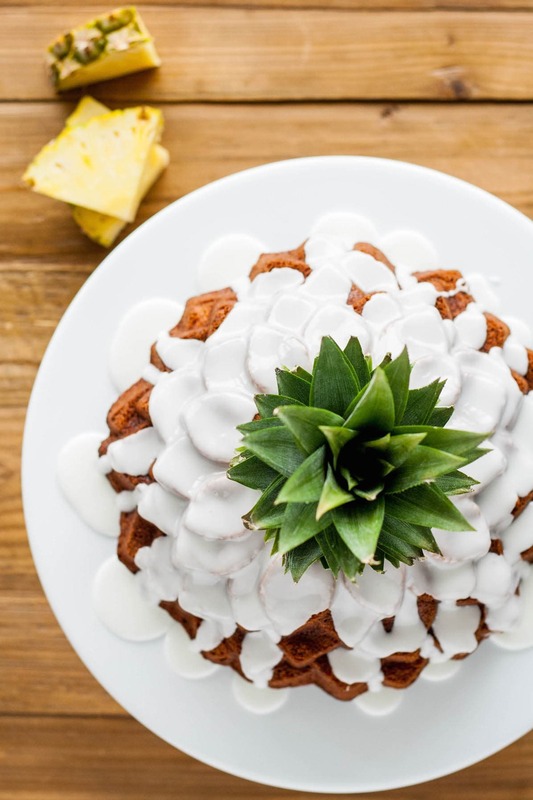 This Aloha Bundt cake is loaded with the very best Hawaii has to offer - bananas, pineapple, coconut, and macadamia nuts! Preheat oven to 350F and grease a 10 or 12 cup Bundt pan with cooking spray. In a medium bowl, whisk together flour, cinnamon, baking soda, and salt. In the bowl of an electric mixer, beat sugar, oil, and vanilla until combined. Add eggs one at a time, fully incorporating after each addition. Beat till pale and fluffy (approx. 3-4 mins). Add banana, pineapple, coconut, and macadamia nuts and mix until combined. Pour into prepared Bundt pan and smooth the top with a spatula. Rap Bundt pan on counter a couple of times to release air bubbles and fill nooks and crannies. Bake until a cake tester comes out mostly clean (approx. 60-70mins). Cool on a wire rack for 10mins. Rap pan against counter to loosen the cake and turn out onto wire rack. Combine sugar and pineapple juice in a small measuring cup. Whisk with a fork until combined and lumps are gone. Add more juice as needed until desired consistency is reached. Pour over cooled Bundt Cake. * I freeze my over-ripe bananas and thaw them on the counter for an hour before using. Your cakes are amazing. I have to make a variety for a brunch and I am wondering if the Aloha, Rocky Road and Oreo can be frozen with or without the glaze. Also the Oreo cake looks amazing in that pan, but I don’t have access to the pan. Do you have a suggestion what to use instead. Also for the Mocha Chocolate and lemon poppyseed cakes can they be frozen. Hi Marsha! They can all be frozen without the glaze, but be sure that they are wrapped well in something airtight! 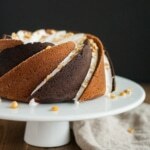 For the Oreo Bundt, you can use any 10 or 12 cup Bundt pan. And yes, the Mocha and Lemon Poppyseed cakes can be frozen too. I hope that helps! Hi John! I’m so sorry to hear that 😕 Baking with bananas can be a challenge. I sometimes get dense and heavy loaves too and am trying to figure out why. I know that over mixing can be a culprit — making the cake dense and heavy. Did you use fresh or frozen/thawed bananas? Thank for replying Olivia, Yes I used fresh bananas and fresh pineapple also mashed them both with potato masher, I must admit I am a 79 year old novice I’m afraid Plus I am male so that could have a big bearing on it. But i will keep on trying. Hi John! Hmm I wonder if the fresh pineapple had something to do with it, maybe it released more water or something and made the cake more dense? The fact that you’re 79 and a novice is amazing and I’m so excited that you’re trying my recipes! Have you tried my Triple Chocolate Banana bread? That one’s maybe an easier one to start with. You can do it all in one bowl and there’s less of a risk of overmixing too. Here’s the link in case you want to give it a go :). Thanks Olivia, I have looked at your recipe and will definitely give that a go, I am salivating at the thought, and I am sure my son and family will enjoy too. but I must give the bundt cake another go I will not be beaten. How would you propose to alter this recipe for a nut allergy? Absolutely gorgeous photography! Making this for my Easter dessert tonight! Thanks for the recipe! I made it today for a church party and it got great reviews! I had a few people ask for the recipe so I emailed them the link. I have to agree with Palma, the banana did overpower the pineapple in my cake. Next time I make it I will decrease the banana and cinnamon and increase the pineapple. Thank you so much for sharing, I really appreciate it! Thanks so much for your feedback Krystal! I’m so glad you liked it 😄. Oh wow I love everything about this post Olivia. 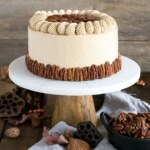 The cake looks absolutely delicious, the nuts have so appropriately taken their place in the cake! Photography is beautiful! You’ve done a splendid job 🙂 Thanks for being a part of this group. Gorgeous photos of an absolutely stunning cake! Such a beaut! I’m sorry I wasn’t able to play along this month but seeing this makes me feel like I still got to join in on the fun. Absolutely stunning! An Aloha volcano of glaze and deliciousness. Very creative!! Thanks Margaret! I totally didn’t even THINK of the volcano aspect. Perfect! In the process of yumming all the recipes form FBC I try not to get distracted by the photos (it’s tough work to yum them all!) but WOW your photos just screamed at me while scrolling. You do a gorgeous photography job. Had to stop and say it! Simply beautiful!! Very nicely done! I agree that placing the pineapple green atop your cake was brilliant. It did make it look like a pineapple. I’m sure this tasted as good as it looks. Kudos! This looks amazing…and makes me want to rush right out and buy a pineapple!!! 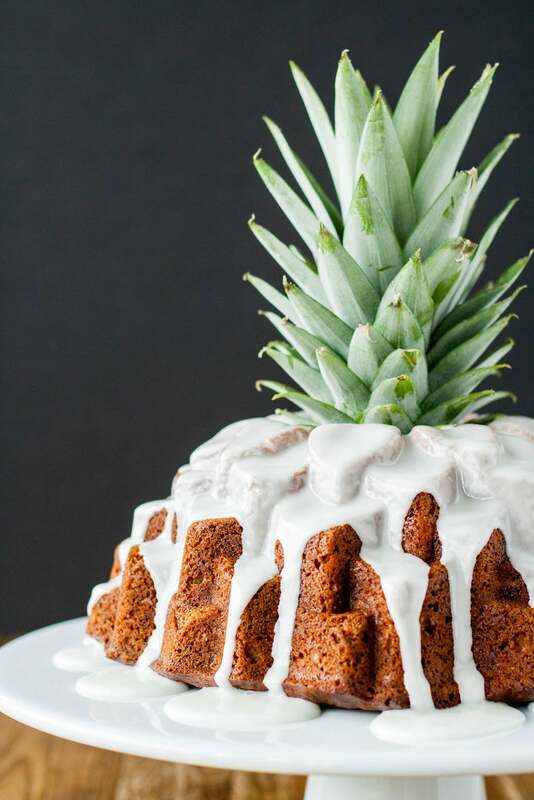 The moment I saw the picture on Foodgawker, I knew the recipe was yours – you’re the queen of Bundt cakes, every single one is so beautiful and has the perfect texture. well done! Thanks Ansh! I want to go back tooooo! 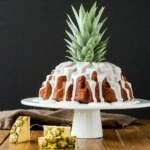 That Aloha bundt pan is hilarious! Kudos to you for resisting the urge – your food styling is wonderful. I know, right! So funny. Had I come across it you can bet I would have snagged it though! How awesome is this!?!?! I’m obsessed with this cake, Olivia! So so pretty! Beautifully decorated Bundt… Thanx for participating.. It certainly does scream Hawaii!! Great job Liv. Wow that looks like an awesome cake! 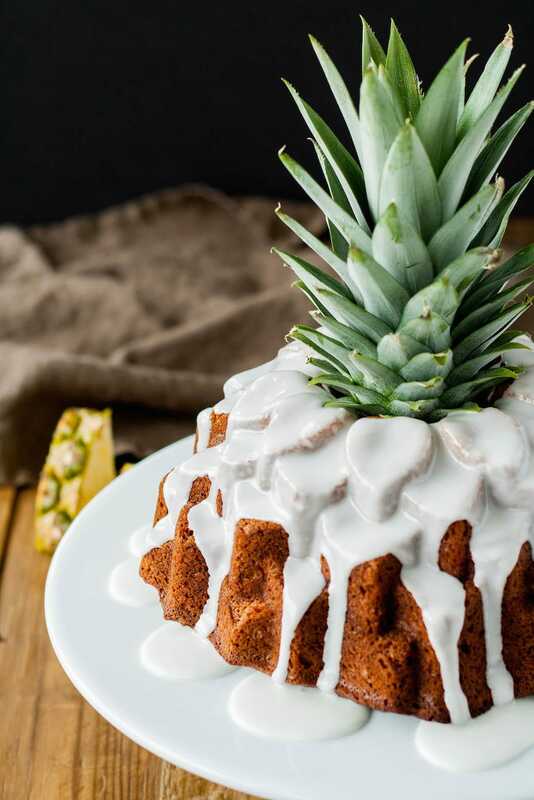 I love the way you decorated it with the pineapple stem–so festive 🙂 All the flavors in here sound fabulous! Thanks June! The pineapple stem was a cool touch I think :). My jaw dropped when I first saw your Instagram post for this, and the website photos are even better! This looks absolutely AMAZING! My boyfriend is a huge pineapple lover, too, so I suspect this is going to be baked sometime soon! 😀 😀 😀 Thanks so much Alanna! I’m so happy with how it turned out. I hope you do make it soon and be sure to let me know how it turns out!! This is gorgeous and sounds so tasty! Love it! Such a pretty cake yet again, I just adore that pineapple top poking out from the cake. Both the cake and glaze look wonderful. Wou!! 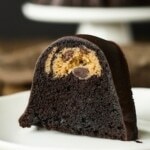 Your bundt it´s incredible gorgeous!! I love the decorations with the pineapple leaves, and the pictures are amazing. Congratulations.!! When I read recipes on the internet, I am always amazed at how many people ask for substitutions because they don’t like many of the ingredients, including main ingredients. Why do people that don’t like food read flood blogs anyway? I can list about 5 foods that I don’t want to eat and they are organ meats. Haha so true!! I haven’t had it happen too much, thankfully, but this one is loaded with stuff so I figured SOMEone would want to modify ;). OMG, this is GORGEOUS. My sister LOVES pineapples and this looks like the perfect cake for her! Pinning it for her birthday. Oh man, I just LOVE the styling on this. The flavor combination sounds like a more tropical hummingbird cake with those macadamias thrown in, wow!